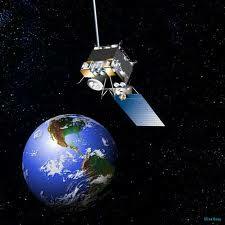 Weather satellites carry instruments called radiometers (not cameras) that scan the Earth to form images. These instruments usually have some sort of small telescope or antenna, a scanning mechanism, and one or more detectors that detect either visible, infrared, or microwave radiation for the purpose of monitoring weather systems around the world. The measurements these instruments make are in the form of electrical voltages, which are digitized and then transmitted to receiving stations on the ground. The data are then relayed to various weather forecast centers around the world, and are made available over the internet in the form of images. Because weather changes quickly, the time from satellite measurement to image availability can be less than a minute. Most of the satellites and instruments they carry are designed to operate for 3 to 7 years, although many of them last much longer than that. 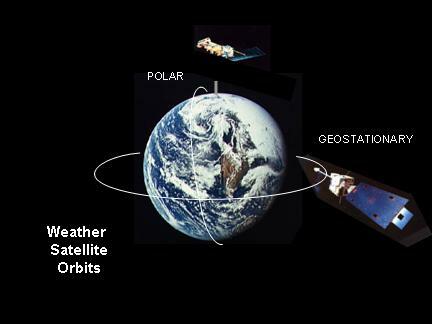 Weather satellites are put into one of two kinds of orbits around the Earth, each of which has advantages (and disadvantages) for weather monitoring. The first is a "geostationary" orbit, with the satellite at a very high altitude (about 22,500 miles) and orbiting over the equator at the same rate that the Earth turns. This allows the satellite to view the same geographic area continuously, and is used to provide most of the satellite imagery you see on TV or the internet. For instance, GOES-East and GOES-West provide coverage of much of the Western Hemisphere, from the western coast of Africa to the West Pacific, and the Arctic to the Antarctic. The European Space Agency's Meteosat satellite provides coverage of Europe and Africa. The disadvantages of a geostationary orbit are (1) its very high altitude, which requires elaborate telescopes and precise scanning mechanisisms in order to image the Earth at high resolution (currently, 1 km at best); and (2) only a portion of the Earth can be viewed. The other orbit type is called near-polar, sun-synchronous (or just "polar"), where the satellite is put into a relatively low altitude orbit (around 500 miles) that carries the satellite near the North Pole and the South Pole approximately every 100 minutes. Unlike the geostationary orbit, the polar orbit allows complete Earth coverage as the Earth turns beneath it. These orbits are "sun-synchronous", allowing the satellite to measure the same location on the Earth twice each day at the same local time. Of course, the diadvantage of this orbit is that the satellite can image a particular location only every 12 hours, rather than continuously as in the case of the geostationary satellite. To offset this disadvantage, two satellites put into orbits at different sun-synchronous times have allowed up to 6 hourly monitoring. But because of the lower altitude (500 miles rather than 22,000 miles), the instruments the polar-orbiting satellite carries to image the Earth do not have to be as elaborate in order to achieve the same ground resolution. Also, the lower orbit allows microwave radiometers to be used, which must have relatively large antennas in order to achieve ground resolutions fine enough to be useful. The advantage of microwave radiometers is their ability to measure through clouds to sense precipitation, temperature in different layers of the atmosphere, and surface characteristics like ocean surface winds. 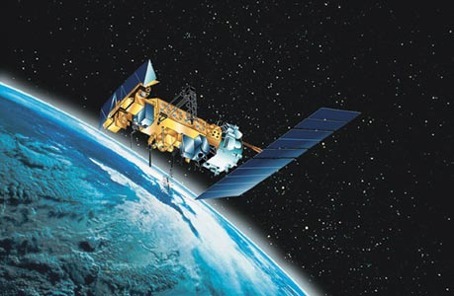 Because of their global coverage, some of the measurements from polar orbiting satellites are put into computerized weather forecast models, which are the basis for weather forecasting.